When a loyalist died, Dark Ghost can take one damage for it's host. The host must then discard a hand card and Dark Ghost disappears. When a rebel died, Dark Ghost draws a card before choosing a host. He can exchange his card for one card from his host at any time. Then Dark Ghost disappears. When a spy died, Dark Ghost can force his host to discard all their cards during their action phase. The host then draws the same number of cards and Dark Ghost disappears. When the first person of a game dies, they can choose to become Dark Ghost. Other players who die later do not get this option. When a player becomes Dark Ghost, they choose another player. This player becomes their host and Dark Ghost relocates to sit directly after the host. Dark Ghost does not affect any distance calculations however. Dark Ghost can look at the cards of the host at any time, but the host cannot see the cards of Dark Ghost. 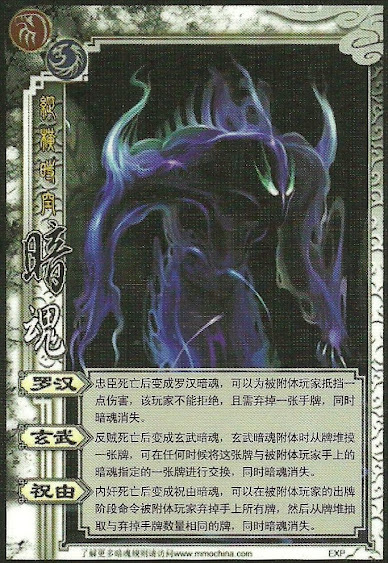 Dark Ghost does not have a turn and cannot play cards as a normal player. He also cannot be targeted by any cards or abilities. Dark Ghost cannot use his ability if the host has insufficient cards. If Dark Ghost's host receives lightning damage from any source, Dark Ghost disappears.